I have transcribed all the entries, to my best ability, although the handwriting is difficult in some places! The listing appears at the end of this page…. In the early days of the growth of Woburn Sands, and it was early, there arose the need for a centre for recreational life for people. It was the first vicar of the parish who took the lead; at that time there was only a handful of influential people here and no shops in the High Street. When the first auction sale of the land of the Swan Farm was held in 1870, the Revd Hay Erskine took the opportunity of buying the paddock adjoining his vicarage and forthwith gave the High Street frontage as a site for the village hall. The remainder of the field was thrown into the Vicarage land; Chapel Street was not made until 10 years later and the Vicar had no legal frontage to it, but there was a footpath outside his hedge from High Street to Hardwick Road though it was not an awarded way. A committee was immediately formed for the purpose of raising a public fund and for the arrangement of the erection of the building. As could be expected, it was led by Mr Erskine and included the brothers Down (of Eagle Malting) Alfred Smith, the horse dealer; Charles Inwood, tailor; George Claridge of the Swan; John Collins, baker and John Pikesley, carpenter and undertaker, a strong appropriate team. 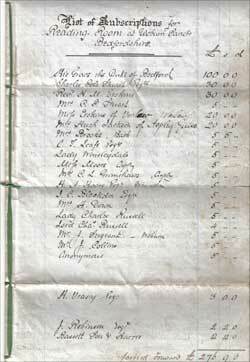 The necessary money was raised within a few months and so enabled plans to be drawn by Mr T. Roberts of Trentham. Why he was chosen as architect is not known as his name does not appear elsewhere locally. The contract went Samuel Foster of Kempston, Bedford’s leading builder, who did much good work in the county and built some of local residences. The contract price was £607, with an agreed date for completion within four months. Preparatory work proceeded apace and on Saturday 6th May 1874, a goodly company assembled and the vicar opened the proceedings at prayer, the whole length of which was reported. He then laid the first brick and others were laid by members of the committee. In the north angle buttress there was inserted a glass bottle holding a parchment, the contents of which may be worth repeating here as it tells a very good story. The location of this bottle is marked by small cross engraved in the brickwork on the north face about 5 ft above the ground. 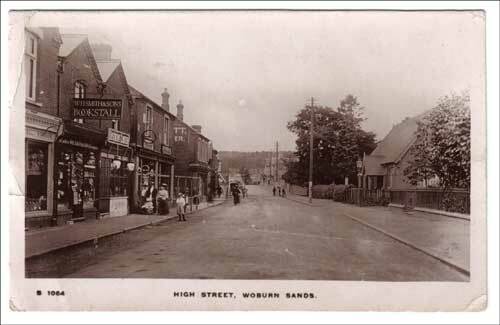 “Woburn Sands, Beds and Bucks. New Reading Room 1874. This Room was erected by voluntary subscription the first brick was laid for the Revd. Hay Montague Erskine then the resident Minister of the New Church, Aspley Guise Heath, on the 9th day of May 1874. Second brick by Mr C. Inwood, third brick by Mr C. Claridge, fourth brick by Mr John Price; then immediately the workmen commenced brickwork. This document is a memorandum of this building and built in the north angle wall of the building. The architect Mr Thomas Roberts, Trentham, the clerk of works Mr J. Price of Woburn, the contractor Mr Samuel Foster, Kempston, Bedford; the works committee the Revd H. M. Erskine, Messrs Henry Down, Frederick William Down, Alfred Smith, Charles Inwood, George Claridge James Pikesley and John Collins, all residents of Woburn Sands. The amount of contract not including furniture and warming apparatus was £607; the building to be finished in four calendar months from 1st May 1874. The ground on which this building was erected was the free gift, to the trustees of the Revd. Hay Montague Erskine, the patron of this useful institution. The address of the Revd Mr Erskine on laying the first brick is enclosed within this glass bottle, which, if at a future time discovered, will be read of some interest. 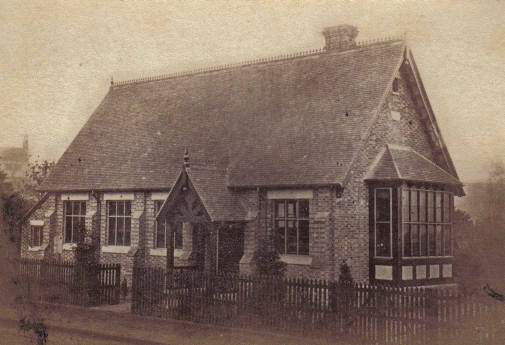 This is the first and only building erected on the west side of the public road from the Parsonage house to the Nursery Ground the opposite the lane turn to Aspley Guise, commonly called Weathercock Lane. The heating system is not mentioned, but it was probably copied from that which is in the Church, and may have also been installed by Hadens. It was hot-air, supplied through a boiler in the basement, but it wore out and was not replaced. For some years the only heating came from the small tortoise stove in the hall. This reminds me of an event that may be told here, and for a moment lighten the solid facts of history. Included in the many uses for which The Institute was put was the sale of furniture by auction. At one, not only was the auctioneer a member of the parish council, but his managing porter was its chairman. When it came to clear up the hall, the coal bucket could not be found; it had been taken by someone with other domestic items in the lot he had purchased and the porters have not noticed the removal. The reader can imagine what questions were asked at the next meeting of the parish council; it was quite a while before “Who sold Parish coal bucket?” was forgotten! The hall now gets its warmth from gas heaters. The Institute was founded under the Literary and Scientific Institutions Act by statutory grant to the Revd Erskine, and was controlled by a body of trustees. It was well used in its early days and had its own library of books; concerts, dances and parish events were held there, its fine pitch-pine floor giving one of the best dancing surfaces in the district. As time passed, the hall, without modern domestic facilities fell out of favour and in 1921 found a rival in the new Social Club. Though only an army hut this had a larger hall with good staging and mod cons. The trustees having no financial support eventually asked the Parish take over the property and this was agreed to at the annual parish meetings 1932, the conveyance been signed on 28th July that year. The council was faced with the problem of keeping the building in good and useful condition, without charge on the rates, and the then chairman Ernest Bathurst took the task in hand personally. He fostered the Badminton Club and it was indeed their rent which paid the running expenses. There was a time when the club met on Monday evening at 8 o’clock, and the Parish Council (monthly) at 7 o’clock. On many occasions, the council, over running their time, had to curtail their arguments and the business was completed by the Chairman and Clerk sitting on the platform – a gallery for the players who had started their games 20 minutes late! During ‘39 War, the building was taken over by the Military as a billet for the troops (as was the Social Club hall) while the Pettit Hall was used as a recreational canteen. Later, improvements were carried out to provide kitchen and modern toilet accommodation, but Badminton still goes on, the height of the building making a favourite rendezvous for the players. When the Newport Pagnell Rural District Council bought the vicar’s land fronting Chapel Street for housing, the Parish Council persuaded them to leave the High Street end vacant against the time it might be wanted for enlargement of hall, but the time came when nothing having been done in this respect, the Rural District Council asked the Parish to take over the site. This was done and it is now used as a public car-park, but the land is available for further extensions if at any time it is required. The Hall continues to be a great asset, with many regular users. 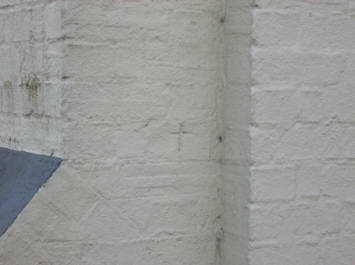 How many people know about the bottle buried in the building, under the cross carved in the brickwork? I bet if you noticed it, you thought it was modern vandalism!